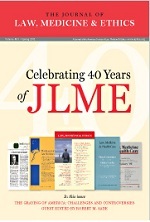 JLME is celebrating its 40th anniversary! We hope you enjoyed the spring cover that kicked off our celebratory spirit. In case you’ve missed it, the cover showed several editions of past JLMEs—from its humble beginnings as a newsletter to the multi-page journal you read today. Our first issue of the year, “The Graying of America: Challenges and Controversies,” guest by Robert M. Sade, is now available online. Please click here to read the latest articles. Now we are working on the summer issue, “Pharmaceutical Firms and the Right to Health,” guest edited by Thana Campos and Thomas Pogge. This symposium is a result of a two-day conference in 2010 at the University of Sao Paulo (Brazil) and its Centre for the Study of Violence (NEV/USP). The distinguished cohort of authors examine global health inequities and pharmaceutical policy matters. The right to health remains a much discussed topic, and the authors employ several perspectives in discussing the role that government and pharmaceutical companies play in providing access to medicines. Brazil, for example, has become a leader in global health because of both its domestic policy and international influence. Stating in their Constitution that “health is a right of all and a duty of the State,” the Brazilian government is also leading efforts for global collaborations with the United Nations and World Trade Organization. The authors also discuss pharmaceutical patents and the availability of generic medicines, the new international organization called the Health Impact Fund, and pharmaceutical companies’ responsibilities to protect health and human rights—among many other topics. The issues are not new, but the authors provide innovative solutions that reflect the changing scope of global health and pharmaceutical policy. Thank you for reading JLME and celebrating its anniversary all year with us! If you would like to share your thoughts on an article or have a suggestion for us, please feel free to contact us. As always, we value your continued readership of JLME. We look forward to hearing from you.